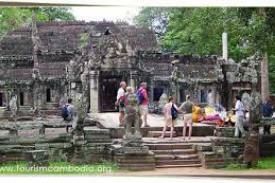 Highlight : Angkor Wat, Ta Prom Temple, City of Angkor Thom, Sunset View of Angkor Wat, Banteay Srie Temple (Lady Temple) and Tonle Sap Great Lake. 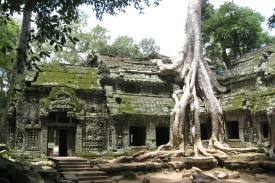 Afternoon: Depart to visit Ta Prohm ( famous after the Tomb Raider movie) with its exciting interplay of stonework, nature , big trees and roots that cover the top of the temple. 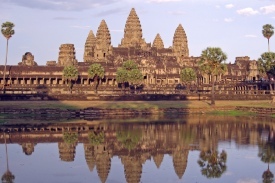 Going on Angkor Wat, admire this architectural wonder and the excellent bas-reliefs. It is worth walking a little between the outer laterite wall and the inside of the moat for a tranquil scene of rural life. Back to hotel for dinner with Apsara Show and overnight stay. 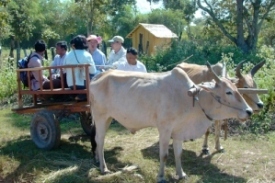 After breakfast, transfer to the Bamboo Train Station which villagers to facilitate the transportation of both goods and passengers. 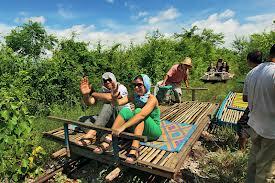 The train’s very basic technology, which is comprised of a platform on 4 wheels which is activated by a small motor for the 8km travel through beautiful landscapes and rice paddies to the next station. 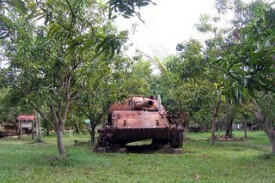 Leave the train and start coming back to Siem Reap and drop by to visit Silkfarm and have a lunch there. 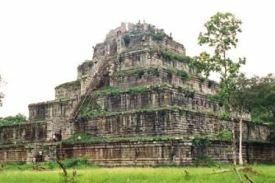 After lunch, go to The Pre-Angkorian temple complex of Sambor Prei Kuk located about 30 kilometers to the north of the town of Kampong Thom, Cambodia. 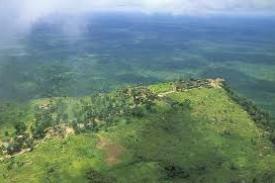 It was also known as Isanapura, and was the capital of the Chenla Kingdom. 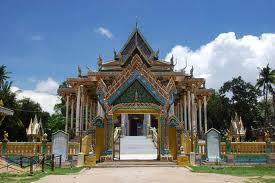 Located on the Eastern bank of Tonle Sap close to the Sen River. 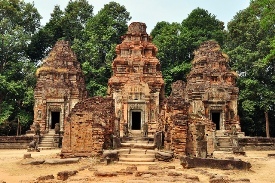 After that, see Banteay Kdeay Bridge on the way back to Siem Reap. 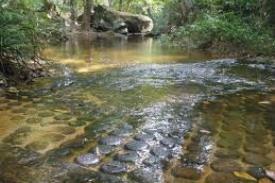 In the morning after your breakfast, our professional tour guide and driver will meet you at Hotel. Then, take an excursion to visit Kravan, Srah Srang and Banteay Kdei, which is a Buddhism temple built by Jayavarman VII for dedicated to chaplain named Mongalatha, spend your time walk into the temple from the East entrance to the West entrance and then Ta Prohm (as known Tomb Raider movie temple) with its exciting interplay of stonework, nature, big tree and root cover on top of temple. 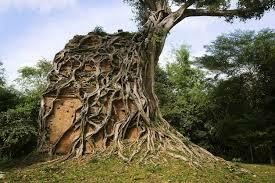 Afternoon: Going on Angkor Wat, admire this architectural wonder and the excellent bas-reliefs. 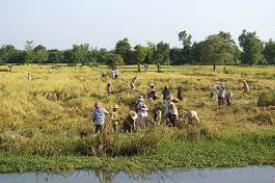 It is worth walking a little between the outer laterite wall and the inside of the moat for a tranquil scene of rural life. Then, go to Tonle Sap to enjoy one of the largest freshwater lakes in Asia and the floating village and look at a beautiful sunset. 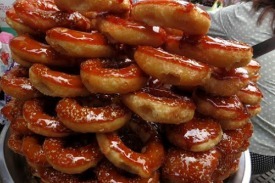 In the morning after your breakfast, our professional tour guide and driver will meet you at Hotel. 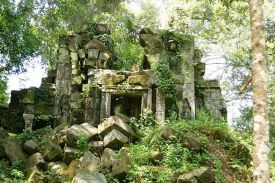 Then, take an excursion to the South Gate of Angkor Thom, both sides of the south gate bridge have a demon and a god statue, who are holding the King Cobra called Naga Vasuki. 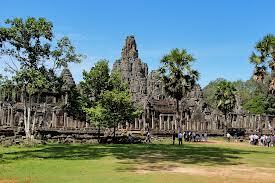 Keep traveling to Bayon. 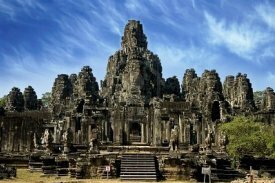 Explore this important temple with its many captivating giant stone faces. It has 54 towers in total and each tower has four faces. 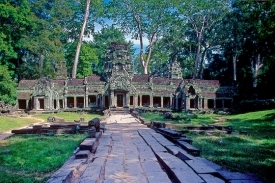 It is at the center of Angkor Thom. Walking out from the north entrance towards Baphoun and then passing by Phimeanakas, with its beautiful lakes, you will then find yourself at the Elephant Terrace. 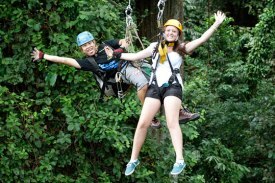 After that, go for Flight of Gibbon, the real rainforest adventure with zipline through the ancient Angkor forest canopy from 21 treetop platforms. Afternoon: After lunch, freely relax your own time. 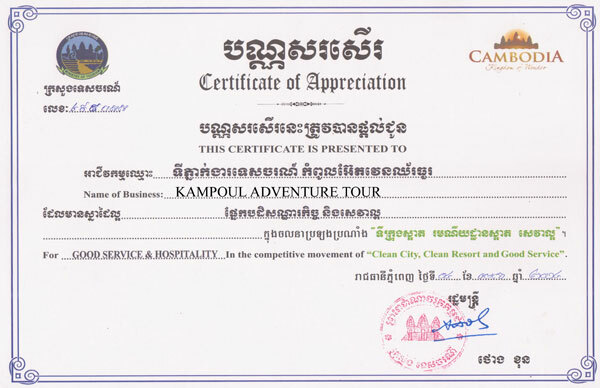 Day 2: Tonle Sap –Departure.